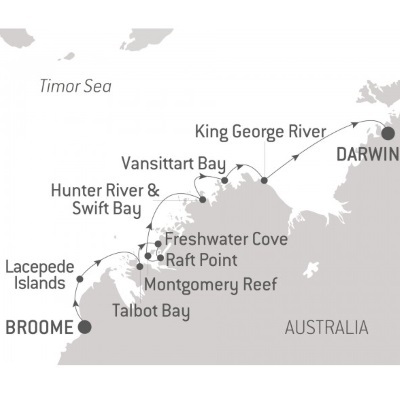 Set sail from Broome to Darwin on your 10-Night Iconic Kimberley Cruise onboard Le Laperouse. 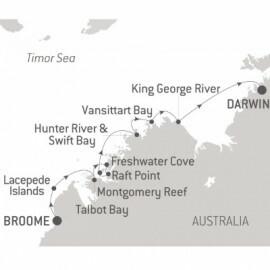 Kimberley is about 2/3 the size of France and surely it's one of the last unspoiled regions on this blue planet. You will visit the Hunter River where you can see mangrove forests and the crocodiles as well as birds. The King George River and the majestice Twin Falls, which are the highest falls in WA, is the highlight of your itinerary. Other spot you will visit are Vansittart Bay, Montgomery Reef.